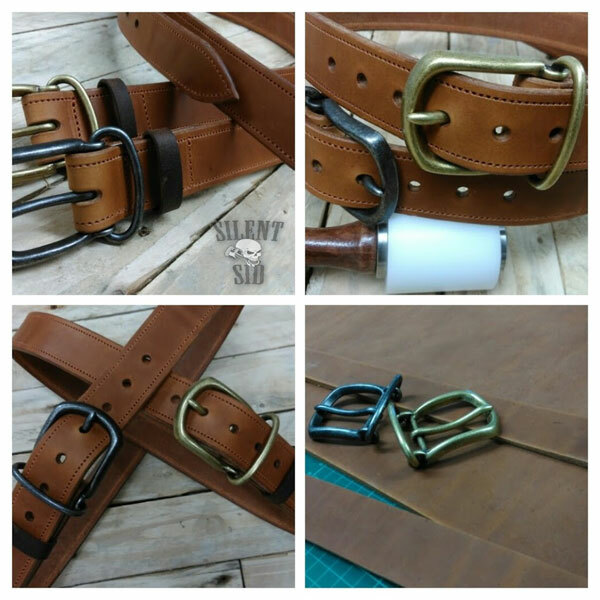 Silent Sid creates belts to suite all tastes. Built to last and to be admired. 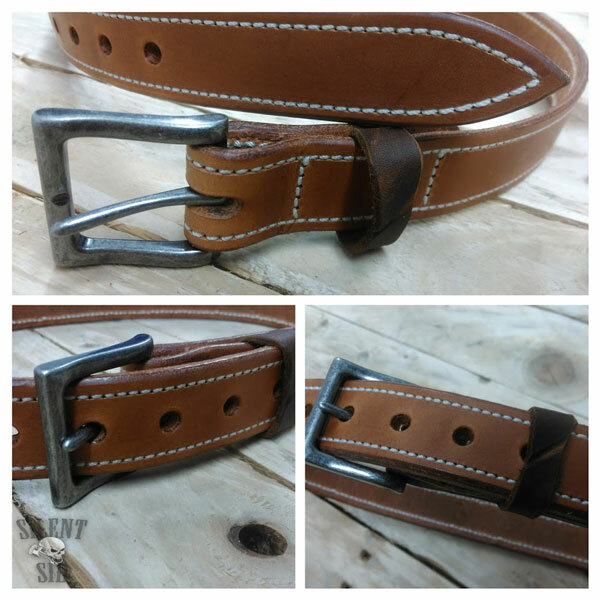 Work belts, Office belts, Formal belts, Gun belts or a great daily casual belt. Whatever the type, we make them to measure to exacting standards. We hand cut the leather from selected hides, we have a selection of various thicknesses of top quality veg tanned leather and some specialist finished hides to choose from and if there's something you'd fancy that we haven't got in stock then we have the suppliers to get that special order hide to us just for you. We always use two layers of leather and bond then stitch them together. We also have our chaps suede lined range which is VERY popular. We have the machinery to cope with ANY thickness of belt from heavy work belts at 1/4"+ thick to thinner office belts. We have a wide range of buckles to choose from and are happy to create a belt for you with one of your own buckles if you wish. The majority of our belts are built to order so the measuremet you give us is the measurement we build it to. 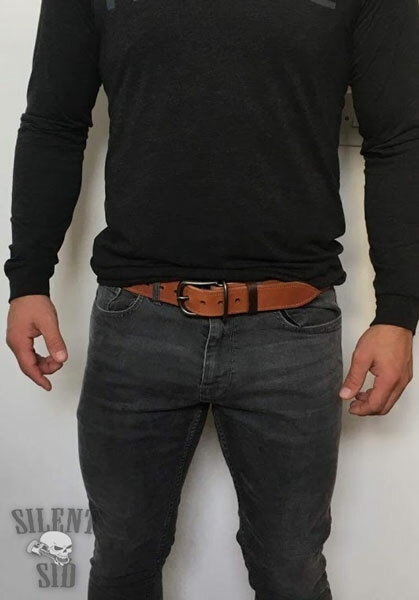 Sometimes, especially when having a belt made as a gift for someone, it's not always that easy to precisely gauge what size to order. The Sizing Information below is there to help you with your measurements. Grab any belt you've got. Make a note of the hole you use the most. Take the belt and measure from where the buckle attaches to the belt to the hole you'd chosen. 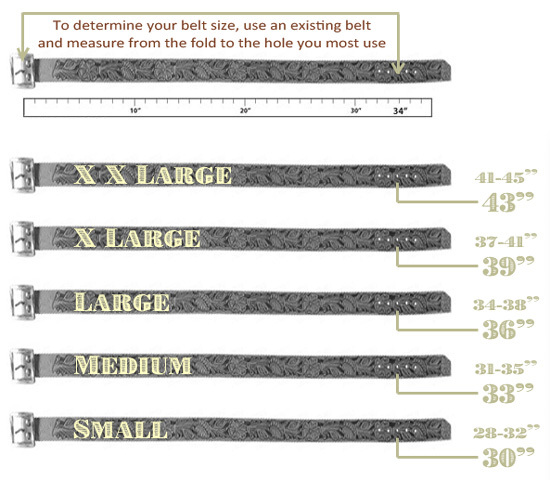 Check the size against the chart below to find your 'Silent Sid' belt size.